European leaders want to step up communication efforts around the Transatlantic Trade and Investment Partnership, the EU-US trade talks that have been marred by controversy. Meeting on 19-20 March, EU leaders will discuss the state of play in the negotiations and will urge the European Commission to make a renewed effort to conclude them by the end of the year. To succeed, the heads of state and government are basically ready to back a “whatever it takes” approach, said a diplomatic source. “Member states and the Commission should step up efforts to communicate the benefits of the agreement and to embrace transparency and dialogue with civil society,” read the draft conclusions of the upcoming EU summit. EU leaders consider TTIP one way to lift the ailing EU economy, together with the implementation of structural reforms and a big investment push through the Juncker plan. According to an estimate drawn up by the Centre for Economic Policy Research for the European Commission, the TTIP agreement will boost the EU’s combined gross domestic product by 0.5% in the ten years after its implementation. Negotiations, however, have been soured by campaigners across Europe opposing several elements of the agreement, including the controversial investor-state dispute settlement (ISDS) clause. On Friday (13 March), MEP and former Commissioner Viviane Reding came out in favour of ditching the clause. She said that only a public court can guarantee the legitimacy of the proceedings, the consistency in the rulings and the independence of the arbitrators. 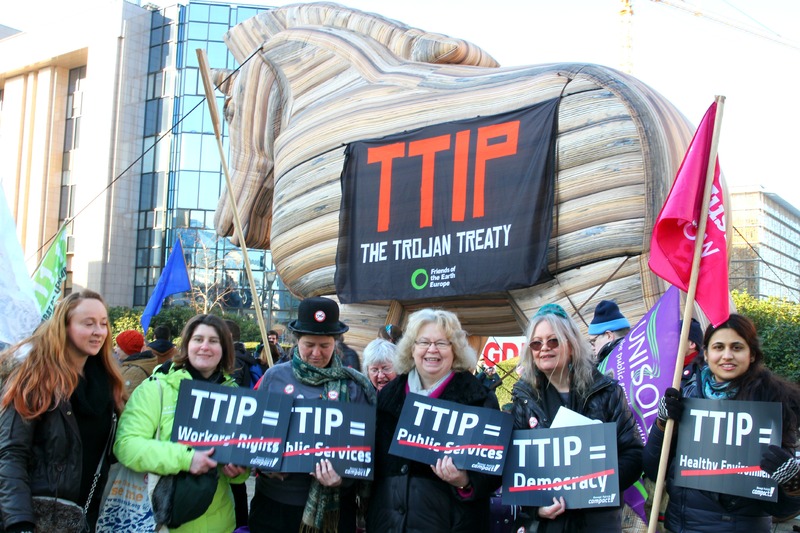 “Together, MEPs should elaborate on a TTIP investment chapter to provide for a permanent court with a clear location, for publicly-paid judges appointed for a specific term, for transparency and for unequivocal investment standards,” she wrote in an op-ed for EURACTIV. MEPs are slated to vote on a draft resolution outlining their position on TTIP at the Parliament’s plenary session in May. The new communication efforts wanted by EU leaders will likely be welcomed. European Trade Commissioner Cecilia Malmström, has already made transparency and engagement with stakeholders a priority of her mandate, as she tries to overcome mounting criticism of the deal. Speaking at an event in Brussels last Thursday (12 March), she said the Commission’s initiatives are starting to bear fruit, particularly on transparency. Many campaigners have criticised the secrecy of the talks. After months of heated debate over the balance between transparency and confidentiality, Malmström decided to publish more EU negotiating texts and to give broader access to other documents on on-going talks to a wider group of parliamentarians and stakeholders. Last week, the Commissioner left the door open for more transparency but adopted a more “wait and see” approach. Malmström argued for more and better communication and engagement with stakeholders. It’s not about creating more information but rather debunking fears and misconceptions about TTIP, she said. “Having information online helps. But myths live on in people’s heads long after they have been disproved,” she added. If the treaty is signed, it will affect almost 40% of world GDP. The transatlantic market is already the most important in the world, with €2 billion of goods and services exchanged every day. The deal could save companies millions of euros and create hundreds of thousands of new jobs on both sides of the Atlantic. The average European household could save €545 per year and European GDP could increase by nearly 0.5%, according to official estimates. So why bother with listening when your mind is already made up?